Turkey is Europe's golfing hot spot right now; spectacular courses and high quality hotels make it a golfer's Turkish Delight! Join our golf group at the Sueno Deluxe Hotel in the town of Belek to celebrate Christmas and bring in the New Year. 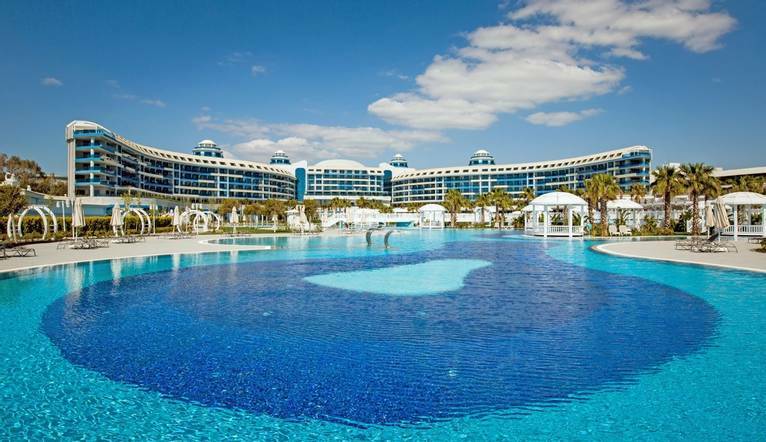 The Sueno Deluxe hotel is one of the finest venues in Belek. The highly rated Pines and Dunes courses are only a 2 minute transfer away at the Sueno Golf resort, and the hotel provides high quality facilities that you can take your pick from on your days off. There will also be a programme of entertainment over the festive season. Pines is the resort’s signature course, and quite simply a golfer’s delight, with its manicured fairways which run blissfully through heavily wooded surroundings, whilst numerous perfectly presented island greens await your approach. Definitely the more challenging of the resort’s two courses, the layout creates a challenge for low and high handicappers alike. Set in a similar environment to the Pines, this well-designed course cleverly incorporates the natural environment to provide an interesting test. Although the par 69 layout is not the longest, the challenge lies in negotiating its numerous island greens and bunkers. On your free days, you can relax and enjoy the hotel’s facilities, or try one of the other courses in Belek. This amazing region is fast becoming one of Europe’s leading golf destinations, with 14 superb courses dotted around the area’s indigenous pine forests benefiting from the region’s wonderful year-round climate. Although, don't forget you will have unlimited golfing opportunities on your doorstep at the Pines and Dunes courses! Our 5-star hotel is set in a great location, close to the town of Belek, the beach and - most importantly - the two Sueno golf courses. With our All-Inclusive package, this hotel promises to provide you with a deluxe experience this Christmas and New Year. Facilities include a choice of indoor or outdoor pools, a spa and gym, and a choice of restaurants and bars. The well-furnished ensuite rooms offer satellite TV, telephone, minibar, safe and WiFi. British citizens need a visa to travel to Turkey. You can apply for a visa online at www.evisa.gov.tr before you go. It costs US$20, payable by VISA/Mastercard debit or credit card only. The transfer time from Antalya Airport to the hotel is approximately 40 minutes, depending on weather and traffic. In the Belek region, Turkish Lira is not accepted in many outlets, so we would recommend taking Euros on this holiday. We suggest a Group Collection to cover transfer drivers, and hotel staff of €15.00 per person. Your Tour Leader will collect this on your behalf and distribute it accordingly, thus relieving you of the burden of who, when and how much to tip. The tipping of housekeeping will be left to your individual discretion (a small amount left in your room on departure should cover this and would be much appreciated). As is customary, ‘the hat’ will be passed around for the driver and guide on all optional excursions. For any meals that are not included in your itinerary, or taxi fares, your Tour Leader can advise of an appropriate ­amount to add on.